Labeling foods as either "good" or "bad" might be a simple way to decide which foods are good for you. The problem with these labels is that they give a negative connotation to foods that can still be part of a healthy diet when enjoyed in moderation. When it comes to protein, certain sources contain components that, in large amounts and over time, could be damaging to your health. This doesn't mean you should avoid these foods altogether, but knowing which foods to look out for can help you make wiser dietary choices. Protein that comes from animal sources like red meat, poultry, eggs and dairy products contain a type of fat known as saturated fat. Eating foods high in saturated fat can raise LDL cholesterol in the blood. When LDL cholesterol accumulates, it can form plaque in the arteries and limit blood flow, resulting in heart disease. Protein sources high in saturated fat include fatty meats and whole-milk products. In addition to being a source of saturated fat, red meat has been linked to certain cancers and diabetes. A study published online in the "The American Journal of Clinical Nutrition" in August 2011 found a link between the consumption of processed red meat and an increased risk of type 2 diabetes. According to the American Cancer Society, red and processed meats have also been associated with colon and prostate cancer. Processed red meat includes foods like bacon, sausage, deli meats and hot dogs. Limiting your intake of these foods is recommended. If you want to reduce the amount of saturated fat in your diet, opt for leaner cuts of meat and low-fat or fat-free dairy products. 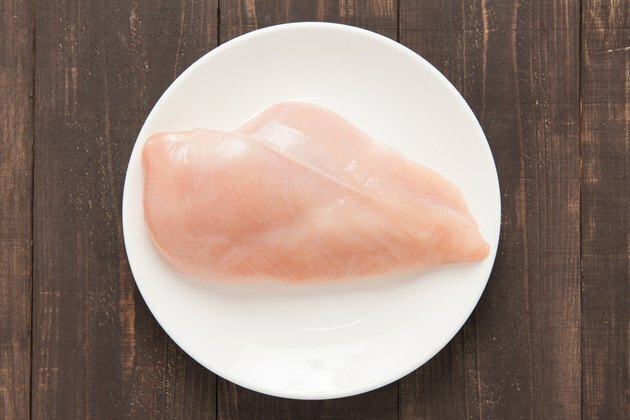 Another approach is to replace high-fat meats with white-meat chicken or turkey, without the skin. Ground turkey can be just as high in saturated fat as ground beef so check the labels, look for the word "lean" on the package, or choose ground turkey breast, which is lower in saturated fat. Fish is also a leaner alternative to fatty meats. Salmon, in particular, is high in omega-3 fatty acids, which can lower your risk of heart disease. What Foods Would Give 30 Grams of Protein?